Water is necessary for human health, and makes up 60 percent of your body weight, according to MayoClinic.com. You obtain water from the food you eat as well as from water or other fluids that you drink. Water travels through your digestive system, like solid food, although it is absorbed rather than digested. Your body absorbs water as soon as you swallow the liquid. It starts its journey through your digestive tract in the mouth. Water consumed alone moves through your system more quickly than solid food. 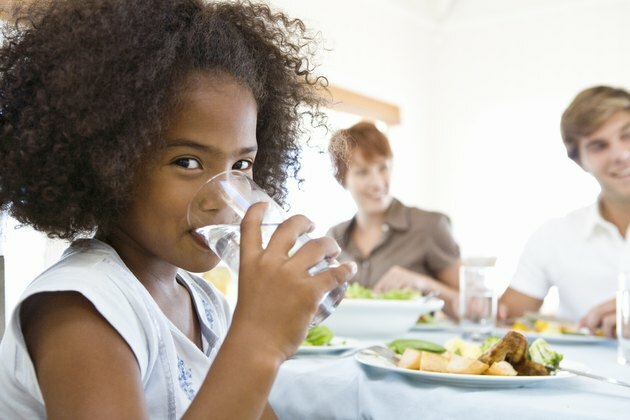 The water you drink during or after a meal mixes with the food you eat and helps your body digest it more efficiently by breaking it down, according to Dr. Michael Picco on MayoClinic.com. Drinking liquid with meals also eases the swallowing process. Water is mainly absorbed in the small intestine, along with any minerals it contains. The small intestine is well-suited for this task, as its lining is covered with small, finger-like protrusions called villi that increase surface area and improve the absorption of nutrients. Water and nutrients from food are absorbed into your bloodstream through these structures. Drinking water before meals helped adult dieters lose weight in a 2010 at Virginia Tech. Study participants who drank 16 ounces of water before meals lost 4.5 pounds more than subjects who did not drink water over the course of the three-month study. The water drinkers were also more successful at maintaining their weight loss. Hydrating prior to meals helps you feel more full, but you must drink the water shortly before meals because liquid moves so quickly through your digestive system that the fullness does not last long. Recommendations vary on the amount of water you should consume every day to stay healthy. MayoClinic.com advises most people to drink at least 8 to 9 cups of water daily. Drink more if you are exercising heavily and losing a lot of body fluids through sweat. Not all the water in your digestive system comes from food and drinking. Much of it comes from digestive juices secreted by your body's glands, according to the the National Digestive Diseases Information Clearinghouse. Water also plays a vital role in most of your body systems, such as nourishing your cells, moving toxins out of your organs and keeping your eyes, ears and nose moist.